Pongalo! Pongal! Advance Pongal wishes to all. Yes, tomorrow the 15th of January is considered to be one of the most auspicious days for us as on this day we pay our gratitude to the sun god for the good harvest. Being far from India, there is no doubt that the real essence of celebrating the harvest festival with family, relatives and friends will be missed. But, I try to make it up by celebrating “the Thai Pongal” with my hubby and kids in a simple manner every year.This year, I am planning it a little big involving my kids to help me in all the three days of Pongal starting from Bhogi Pongal, Surya Pongal to Mattu Pongal. Yes, you heard it right. I am thinking of simulating the experience on these days so that my kids can learn the meaning of our harvest celebration in an entertained way. The first day of the Pongal celebration called “Bogi”, is being celebrated today and is basically a cleansing day. I sat with my kids and made them aware that they would be cleaning their own wardrobe folding and placing all their clothes and discarding the old ones. The ones that look decent, but not the right size for my kids will be going to charity in a separate bag. Then, my kids helped me tidying their own books /toys and decorated the home to give it a new makeover. Finally, I concentrated in the most important place of my home – The Kitchen. A clean kitchen is very crucial for any celebration. It is really important to keep my kitchen clean because it is the place that decides the health of my family. The kitchen is one of the main hiding places for pests like cockroaches as it offers them an abundance source of water and food helping them build their nests. Food poisoning is a threat from these little creatures peeping through kitchen sinks and the only way to limit their infestation is maintaining a good hygiene by cleaning the kitchen tops, clearing rubbish promptly, and using pest control methods. I use the Godrej LAL HIT to eliminate them as its deep reach nozzle helps me to reach the nooks and corners of their hiding place to kill them instantly. Yup! #SayNoToFoodPoisoning. The next day “KannumPongal” starts with sweetened rice called Sakarai Pongal made by boiling rice with lentils, ghee, jaggery and coconut in enough water, making it overflow indicating abundance. Shouting “Pongolo Pongal” is a joy at this moment. The difference in my place here will be that the Sun god for whom this celebration is done will be hiding somewhere because of the current season. The rest of the festival will be followed by exchanging wishes with family/ friends and my little ones happily crunching the juicy sugarcane. The third day is called as MattuPongal. This day is dedicated to the cows as they have been a great support during the harvest. On this day, the cows will be cleaned; their horns will be painted and then decorated with flowers. After a short puja, the cows will be ready in their cart for a ride in the evening with kids shouting wishes in and around the city. This way of celebrations was done when most houses in Pondicherry had access to cows, but today it is mostly celebrated in the villages. One important thing I will be missing on this day far from home is the visit of close relatives. I remember looking forward to my uncles /aunts who generously gifted me monies making my money box overflow. Sigh! 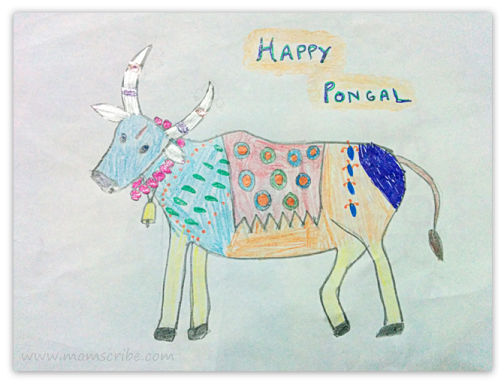 But, I do look forward to simulate some experience by of Mattu Pongal for my kids by letting them draw or paint cow images (updated) and sharing stories of Pongal celebration. The final day of the celebration is the “Kari Naal” which we don’t celebrate, but on this day we have the habit of gifting our maids and others in need with clothes and money thanking them for their support. Some people take a day off on this day for a trip to the beach or visit various places enjoying their day with their family. 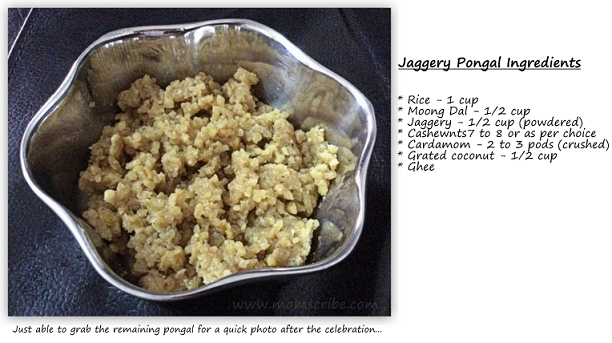 Do you too have any stories to share about your Pongal celebration too? How about the kite flying ? Is it celebrated in Tamilnadu? I have seen people celebrating kite flying festival in Mangaluru beach as well as in Maharashtra. We celebrate harvest festival as Sankranti in Karnataka and we share sesame and jaggery with friends and relatives. One festival, multiple ways of celebration.. That's India, right?